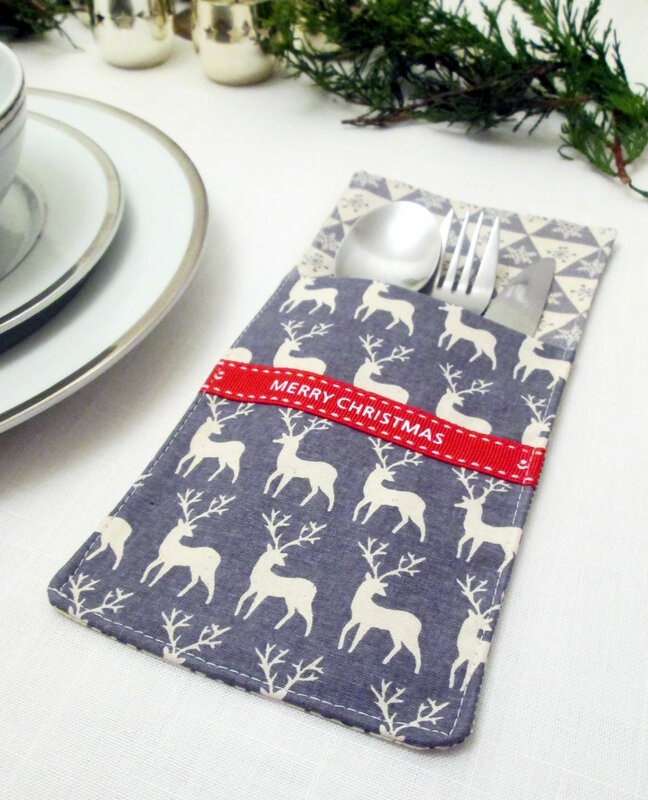 A Christmassy project I have been working on recently is some Christmas cutlery pockets. The problem with being a crafty person is that you often end up hoarding craft supplies. In an effort to prevent the situation from becoming completely out of hand, I try to only buy fabric when I have a specific project in mind. 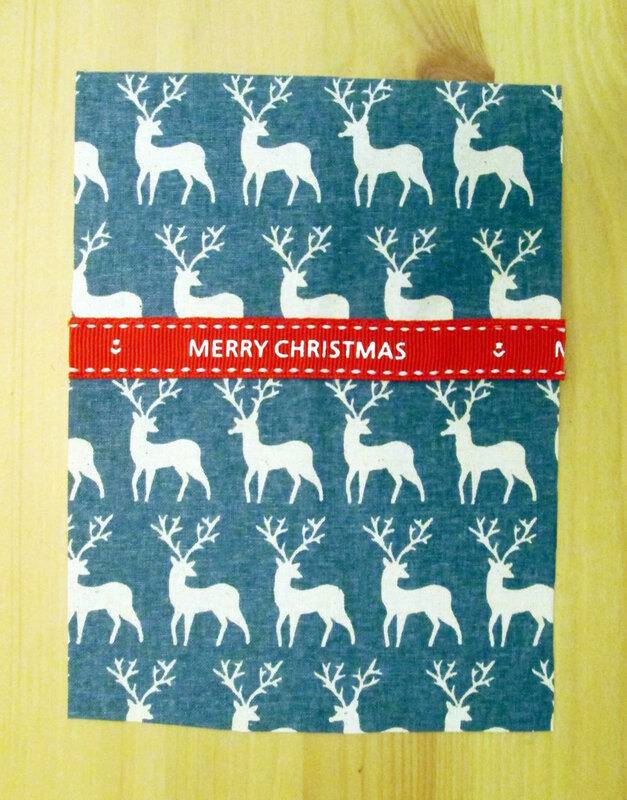 Anyway, a couple of weeks ago I bought some Scandinavian inspired fabric to “make some Christmas stuff”. That was a specific as it got. 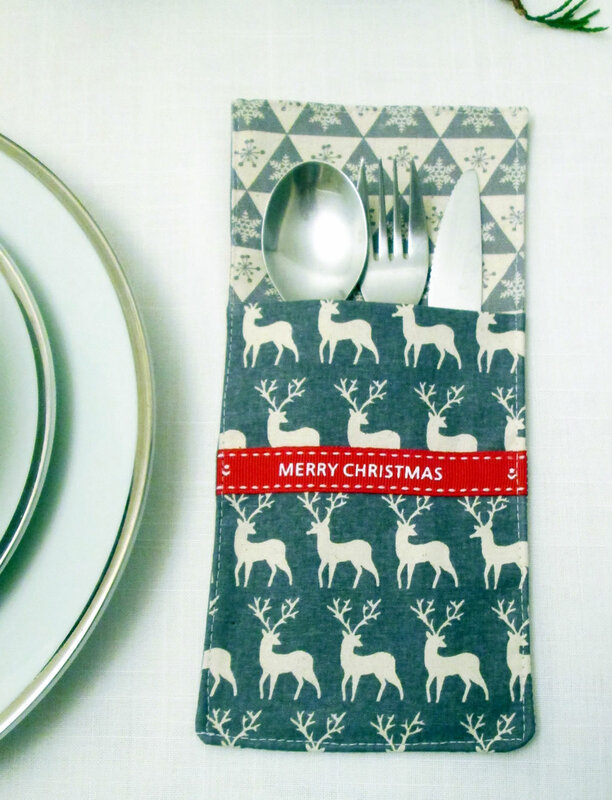 I have made a stocking (you can read about that here) and I have decided that a nice way to use some more of it is to make some cutlery pockets for the table on Christmas Day. 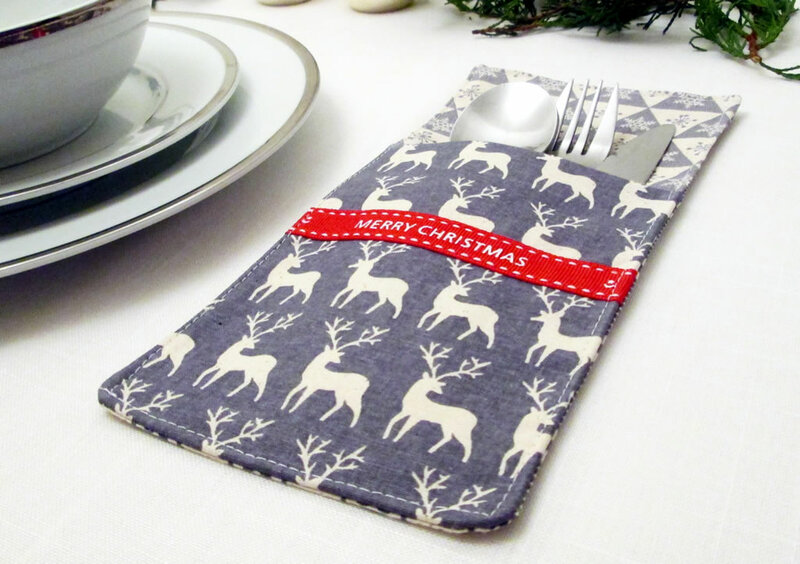 These Christmas cutlery pockets are very quick and easy to make, so if you need to make a lot of them, it shouldn’t take too long. I needed to make 6 and I completed each stage for all 6 before moving on to the next stage. 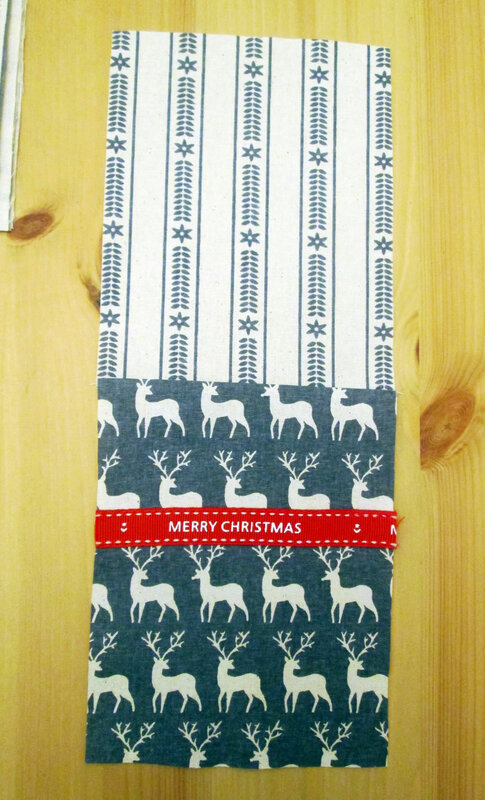 You Will Need: cotton fabric in 2 or 3 designs (I had half a metre in 3 designs and that was way more than I needed! 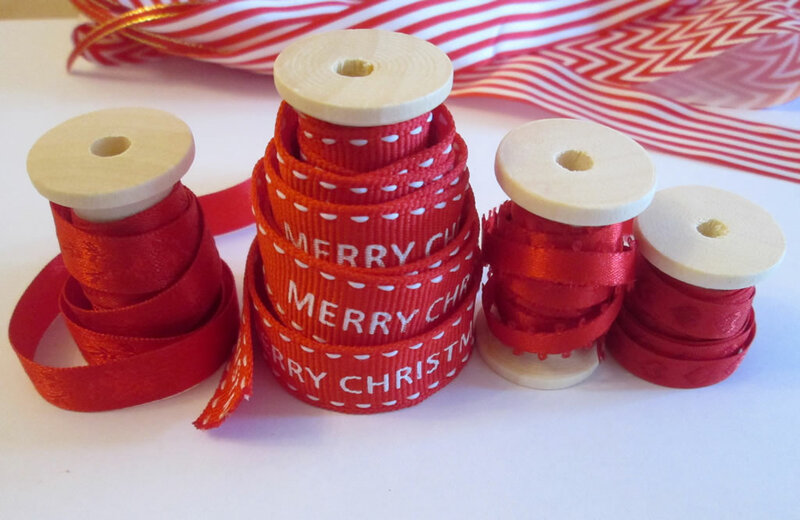 ), ribbon or trim, ruler and pencil, usual sewing supplies. 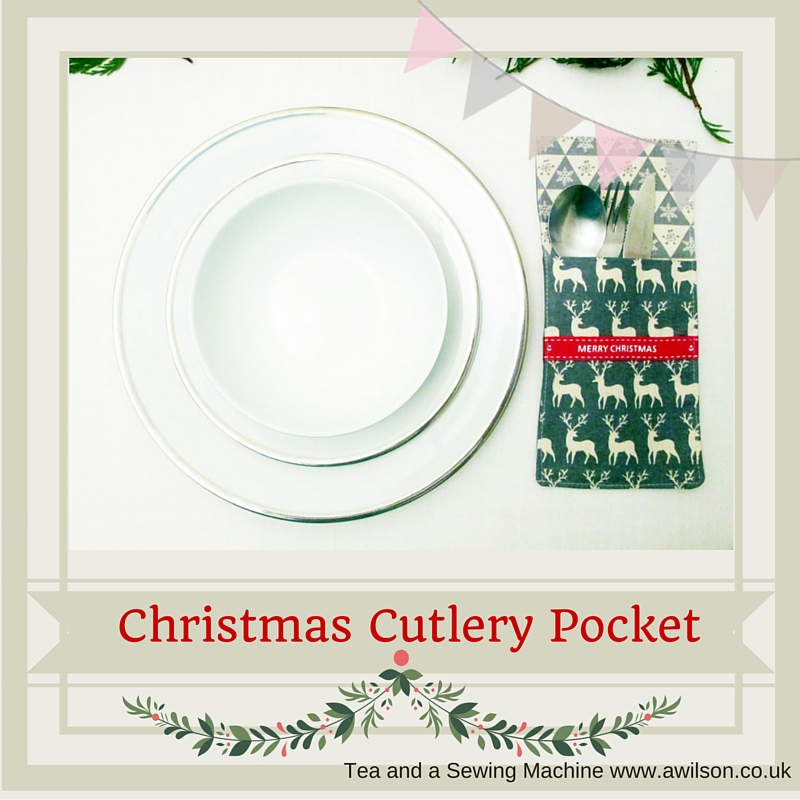 For the main part of the pocket, you will need to cut a front piece and a back piece measuring 12 cm x 26 cm. I drew the rectangle onto a piece of paper first and used that as a template. 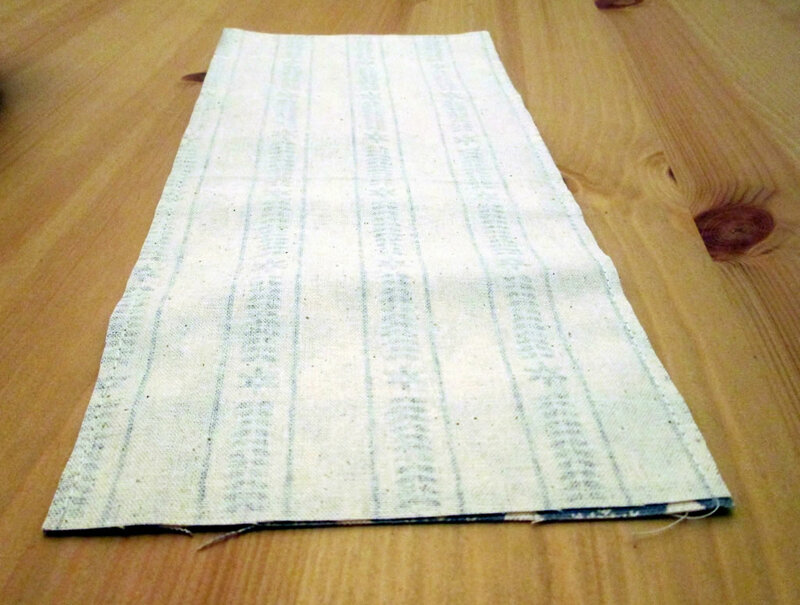 For the pocket section, you will need 1 pocket outer and 1 pocket lining, measuring 12 cm x 16 cm. 1. Sew the trim to the pocket outer. 2. With the right sides together, join the pocket outer to the lining along the top edge. Trim the seam, turn it the right way out and press. 3. Take the larger rectangle that will be the at the front. 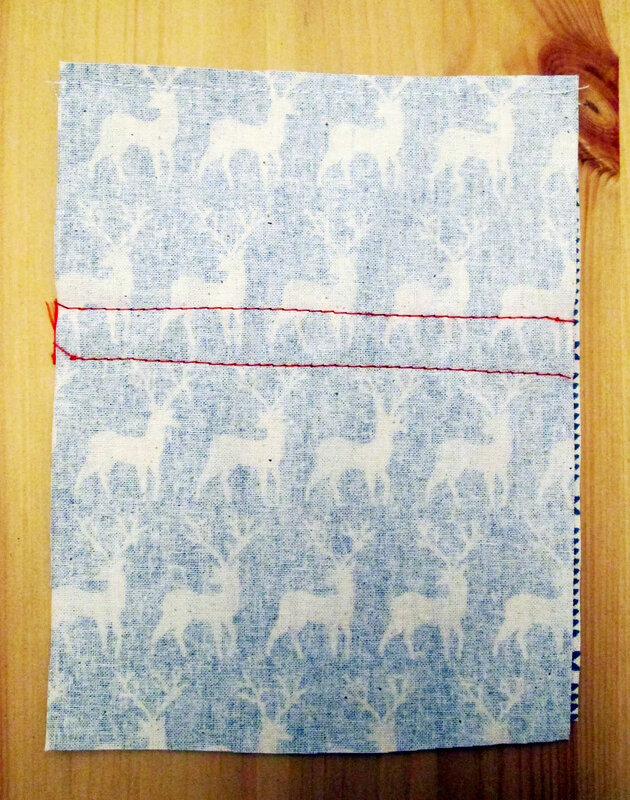 With the right sides up, place the pocket on top of the larger rectangle so that the bottom edges are aligned. 4. Put the other larger rectangle on top facing down. 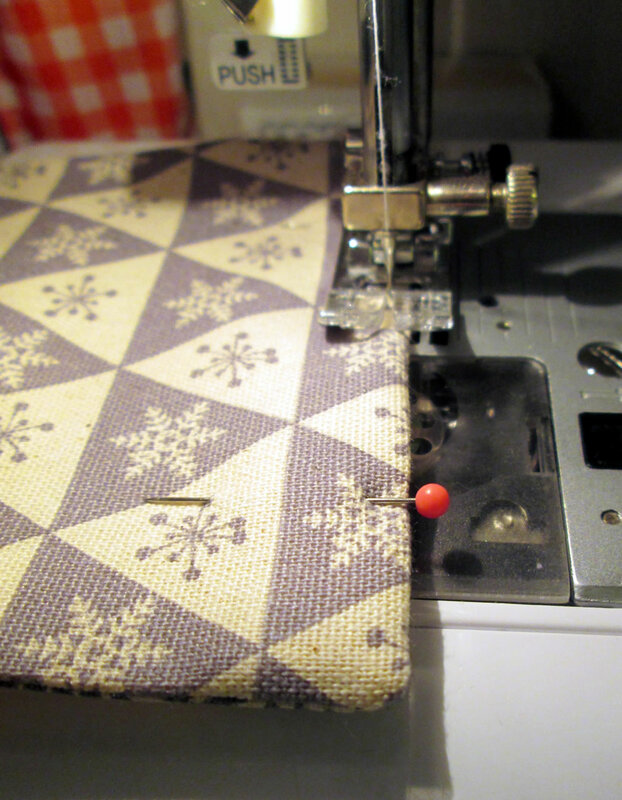 Pin, then sew around the sides and the bottom edge. 5. Turn it the right way out and run the iron over it. 6. Tuck the raw edges at the top inwards. 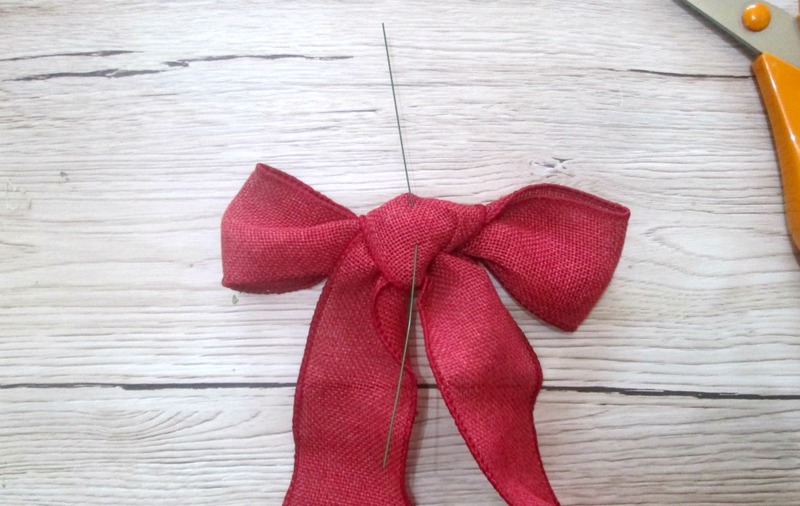 Pin, then top stitch all the way round. 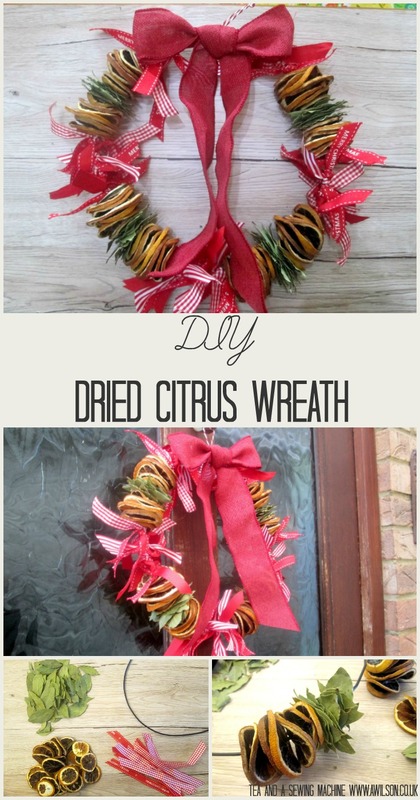 I made them all the same to avoid my boys arguing but you could mix them up a bit, especially if you have odds and ends of Christmas fabric left over from other projects. Christmas always sneaks up on me. 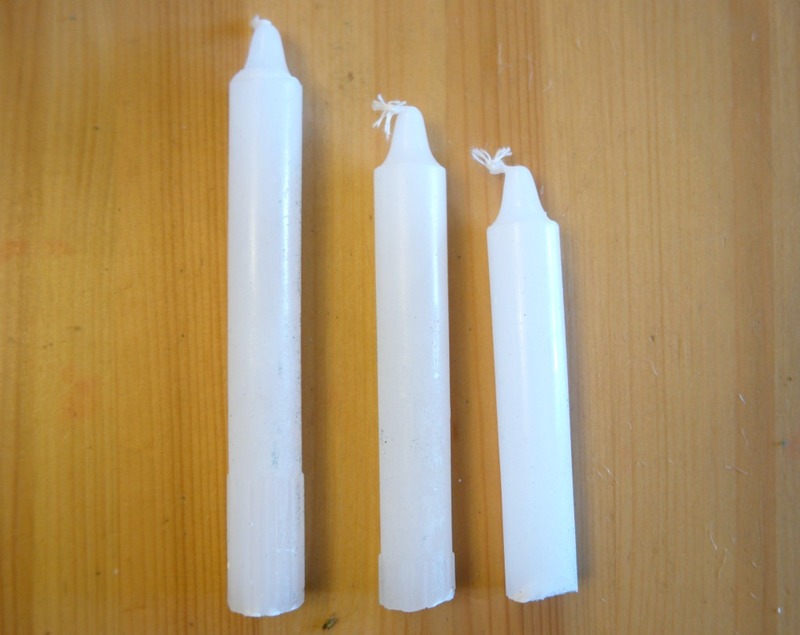 I know the date never changes, but somehow every year I find it’s the end of November before I’ve even started to think about Christmas crafts and what I might make. I suspect it might be partly because all 4 of my boys have birthdays in the autumn and I tend not to think about Christmas until the Season of Birthdays is over. I also don’t like thinking about it too early. I want to feel Christmassy at Christmas. I want to enjoy the cold weather and the twinkly lights. 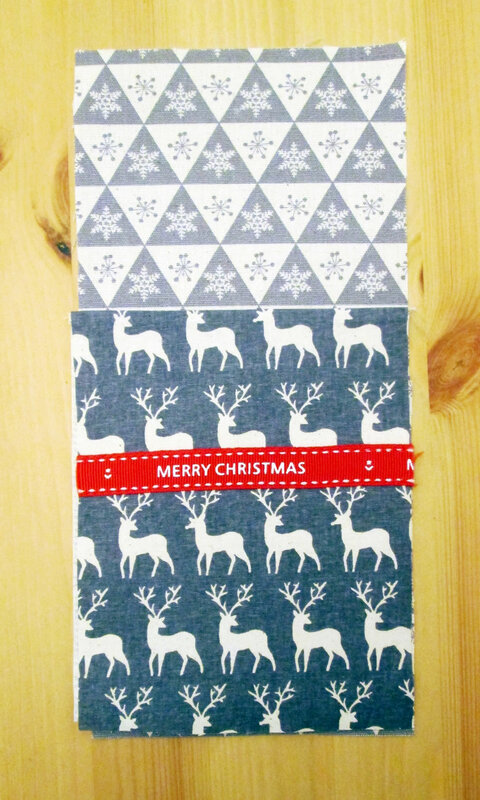 Feeling Christmassy is a hard thing to sustain if you have been doing Christmas crafts since July. 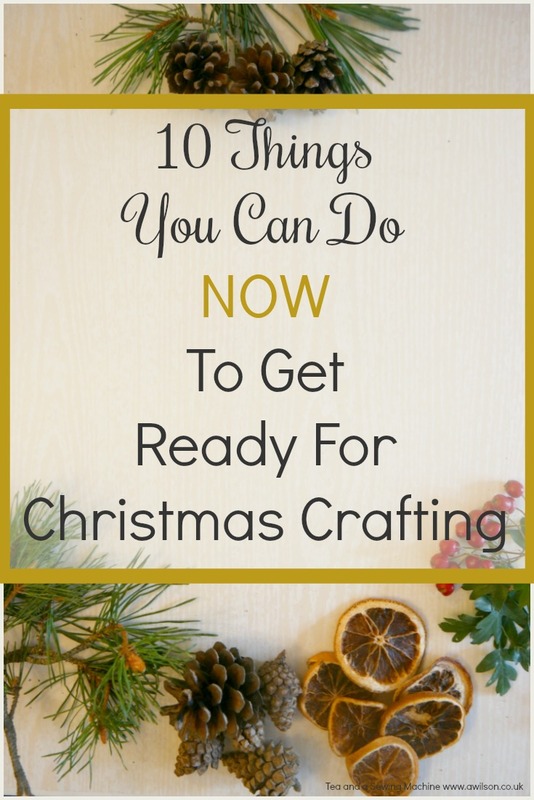 So if you want to get organised for Christmas crafting, here are 10 ideas to help you get ready now before the cold weather arrives without leaving it all to the last minute. 1. Start planning. You can write down ideas if you want to or you could just start having a bit of a think. What is your theme going to be? Red and gold? Blue and white? Natural? 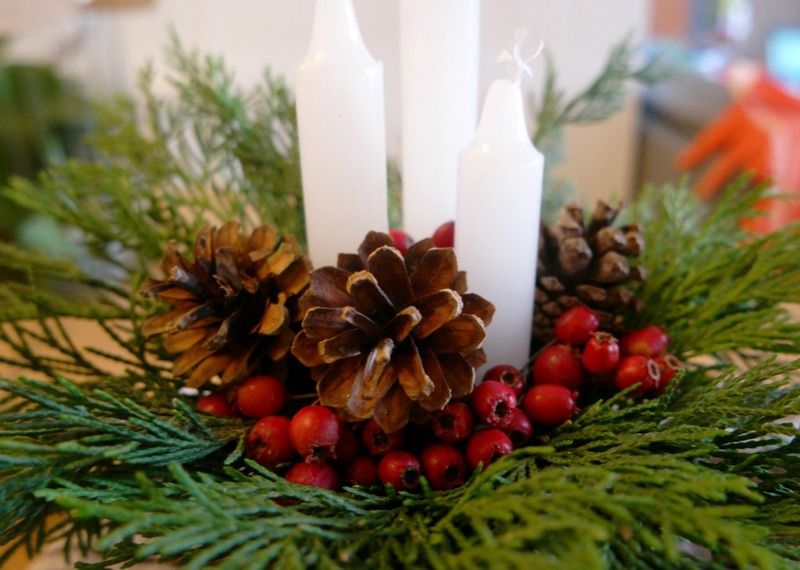 Do you want lots of Scandi style decorations this year? Or things made from nature? Or felt? 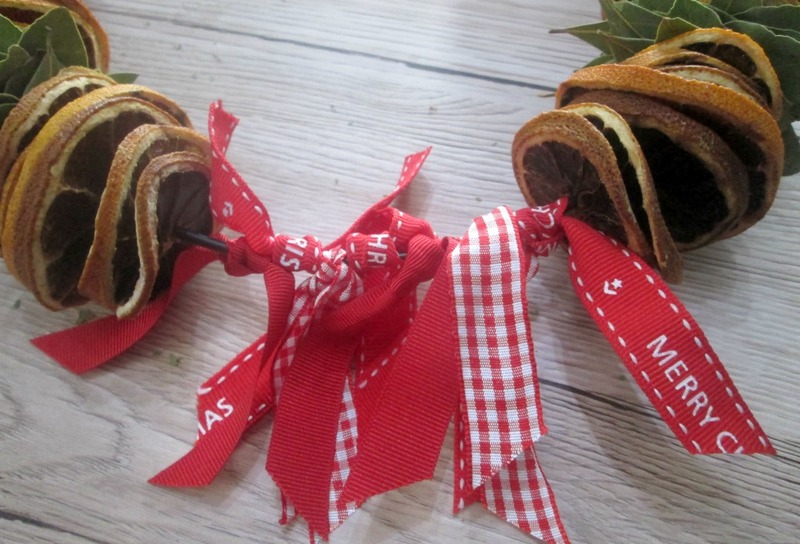 Have you got small ones at home who might like to do some Christmas crafts? 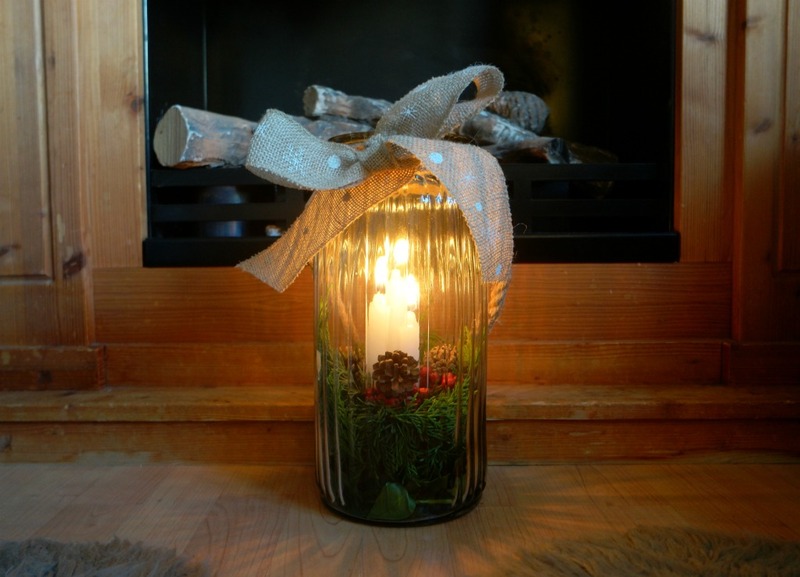 Are you planning on making a lot of gifts or will be you be focusing more on making your home feel Christmassy? 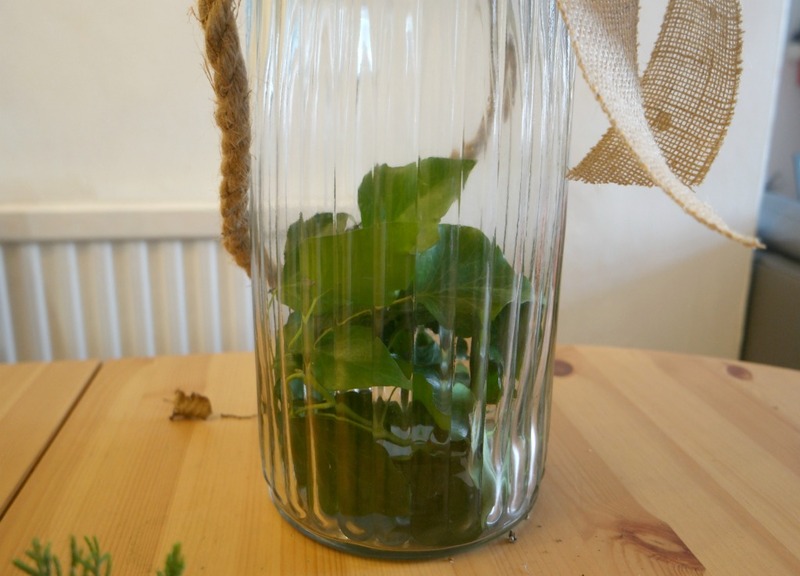 Pinterest is great for organising ideas as well as finding them! 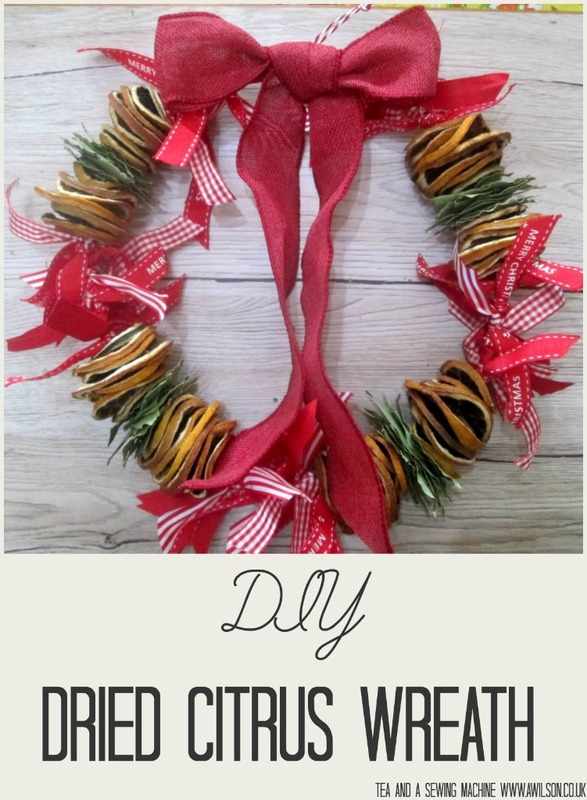 My Christmas Crafts Pinterest board is here. 2. 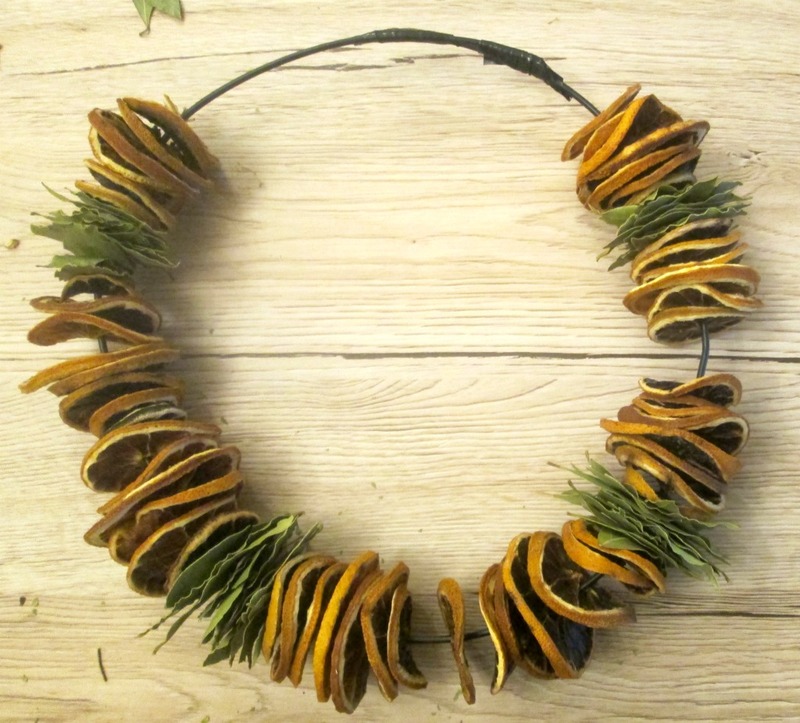 Start collecting pinecones. 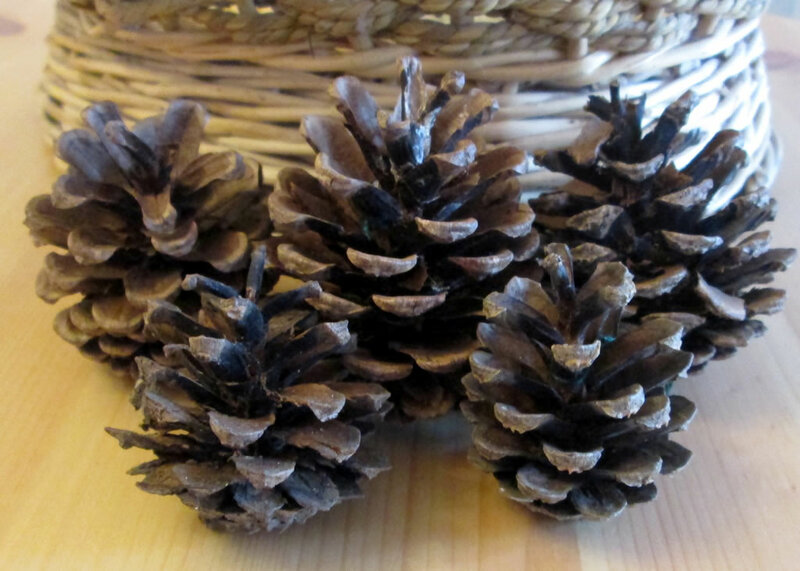 Pinecones are great for autumn crafts too, so collecting them doesn’t have to feel too Christmassy. If there are no pine trees near where you live, plan a day out somewhere that does have them. Even though we live in the country, there are not that many trees near where we live. Thankfully though, there are woods not too far away, so the boys and I will be having a little trip off to the woods at some point over the next month or 2. 3. 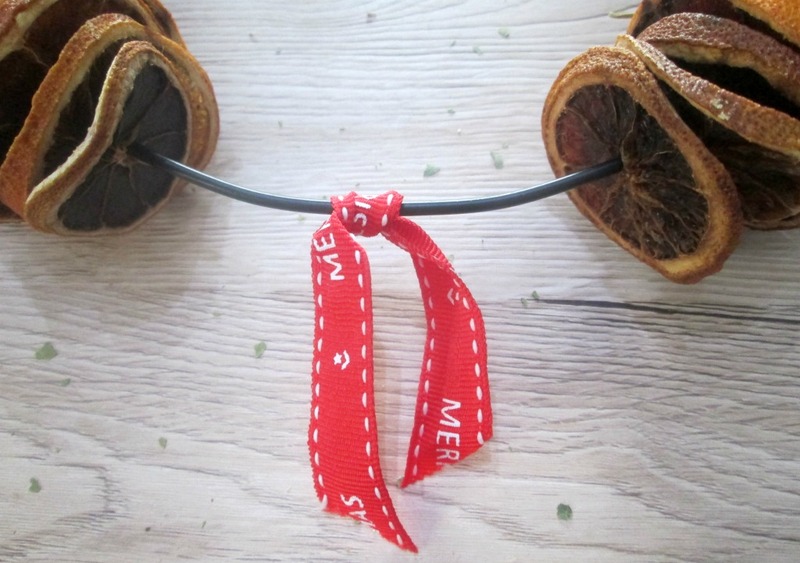 Dry citrus fruit slices. I love to do this! 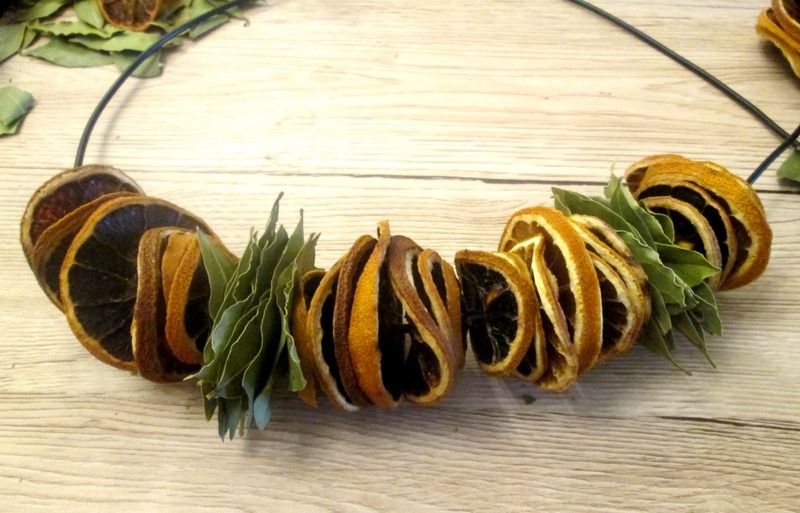 Dried fruit can be used to make garlands, tree decorations and wreaths. 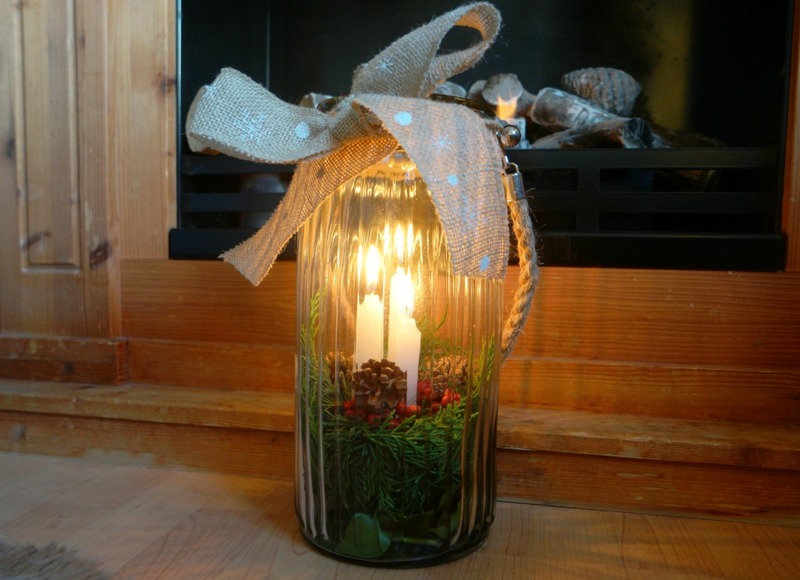 These can be used to decorate your home nearer the time, and they can be given as gifts too. 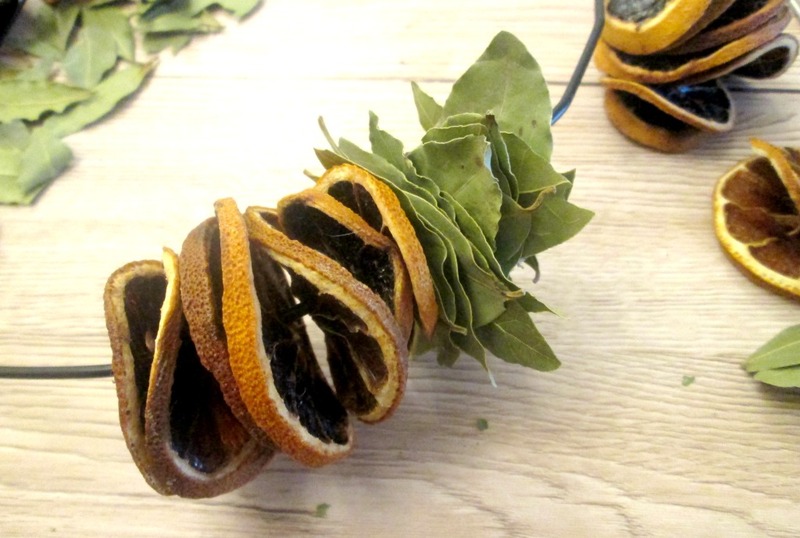 Drying fruit is very easy to do! 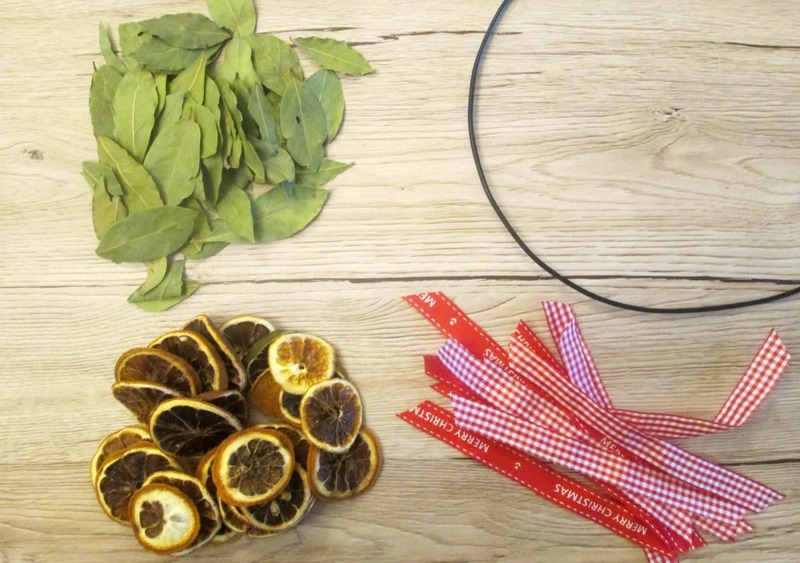 Just slice some citrus fruit thinly and put it in a warm (not hot!) oven for a few hours. Full instructions for doing this can be found here. 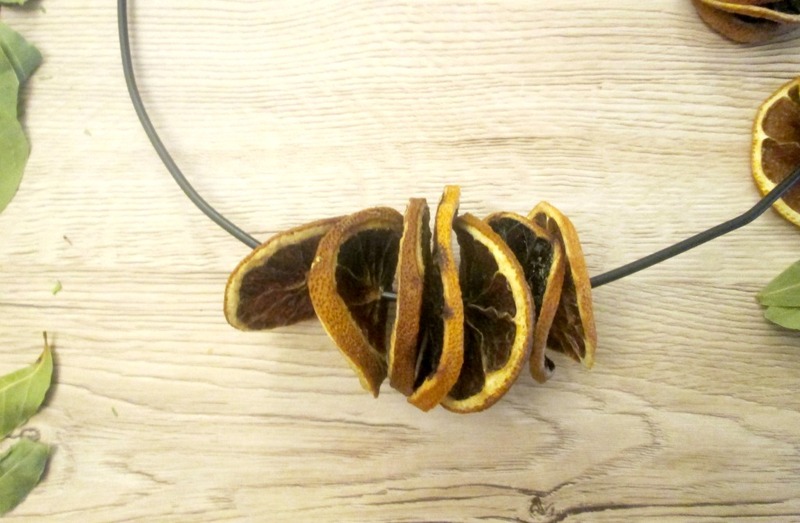 It’s possible to dry whole fruit as well. 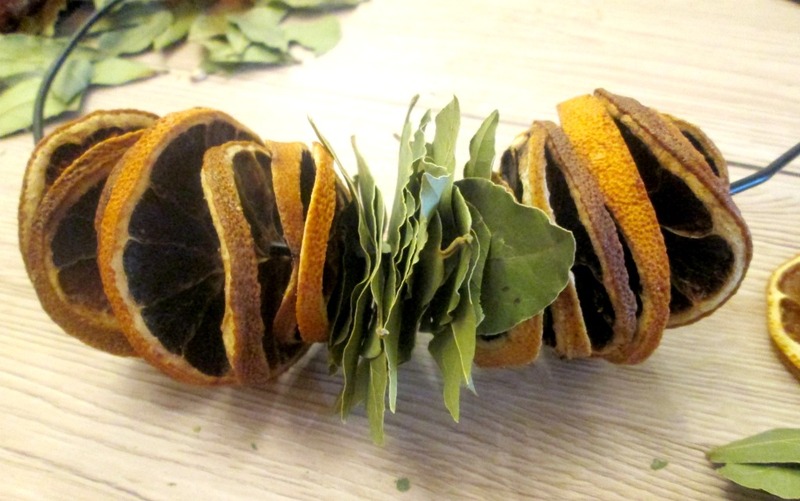 I usually stick to clementines as they’re small and take less time to dry. 4. 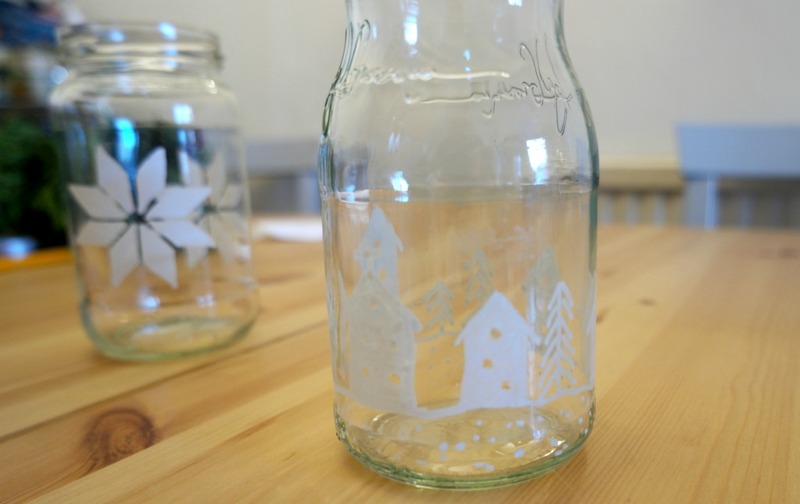 Plan Christmas crafts for your kids. Also plan when you are going to do them. I always find that things get so busy in the run up to Christmas, we end up not having time to do half the things I wanted to. So decide what you want to do and when you want to do them. 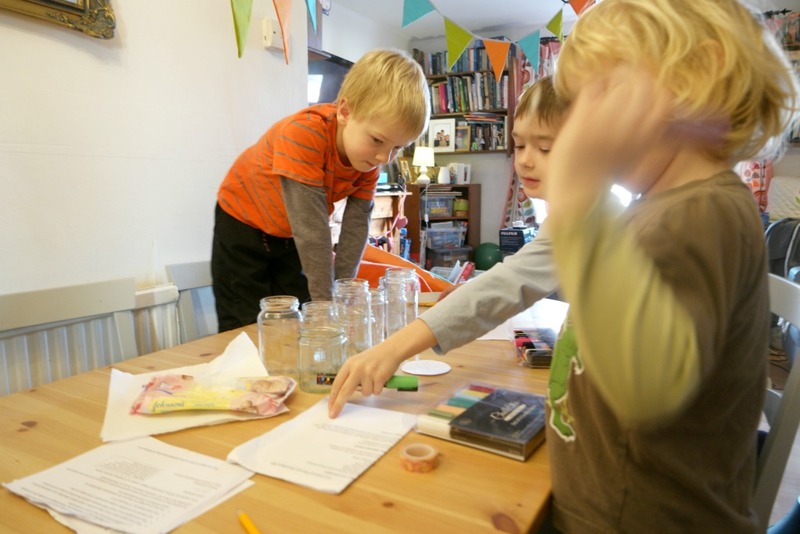 If you have school aged children, it’s nice to have some things planned for them to do as the excitement before the big day is often enough to send everyone loopy. You can arrange them round trips to the woods/ common/ beach to wear them out and keep them busy. 5. 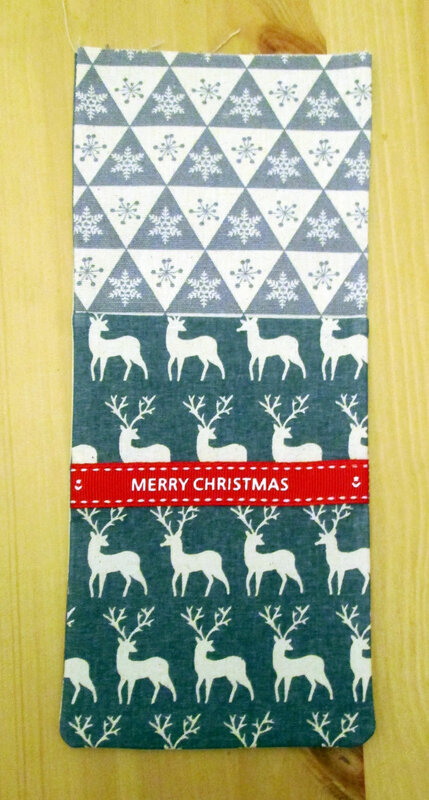 Evaluate your Christmas fabric and ribbon situation. If you see something you need while you are out and about, you can buy it. 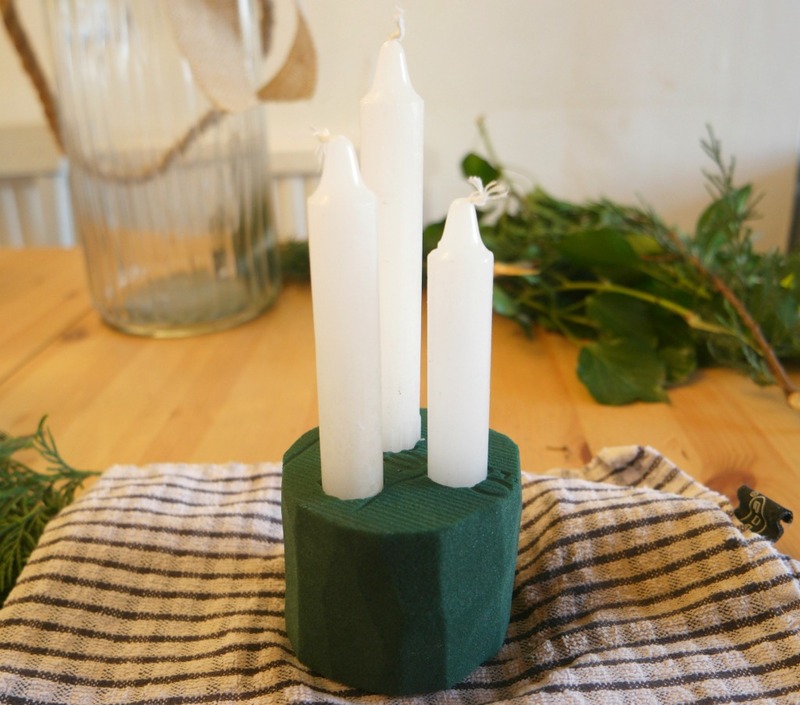 Then when the time comes, you’ll be ready to make stuff without having to brave the Christmas crowds or wait for the postman. 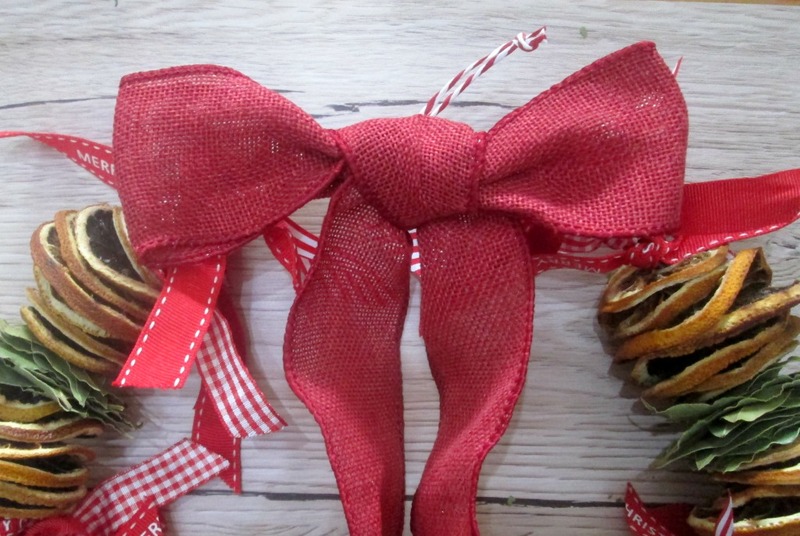 It’s worth mentioning at this point too that shops get their Christmas stock delivered in September, but things like red ribbon, gingham and felt are usually available all year round! So stock up on what you need when you get the chance. 6. Identify where you can obtain greenery. 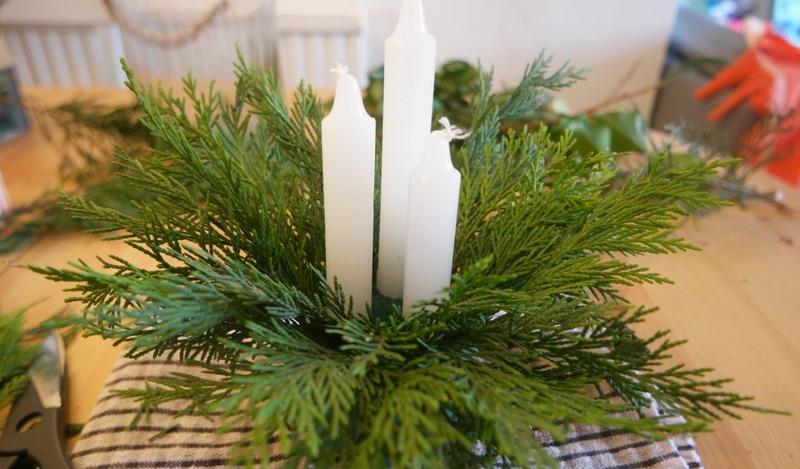 Greenery is so useful for table centrepieces, candle decorations, decorating mantlepieces and for wreaths. 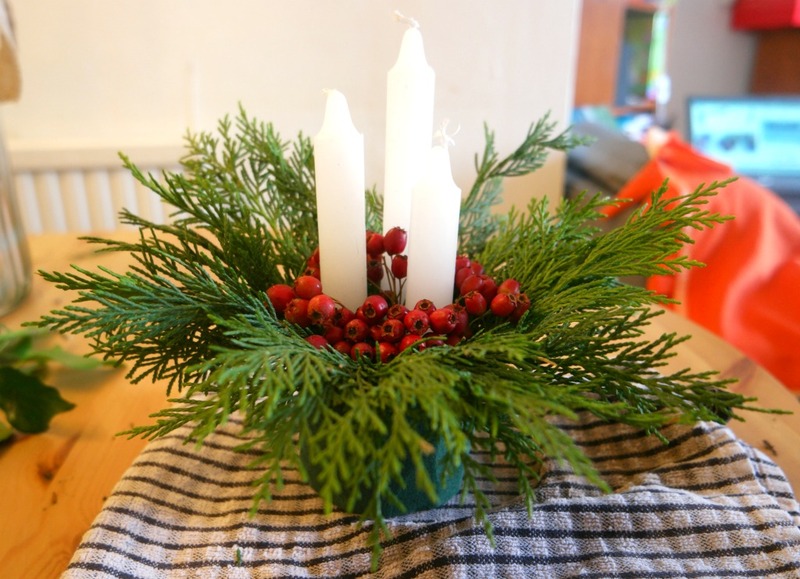 Christmas flowers are usually easy to find, but greenery is often less so. You might have some in the garden, or you might have a neighbour with a laylandii hedge who might let you have some if you ask them. 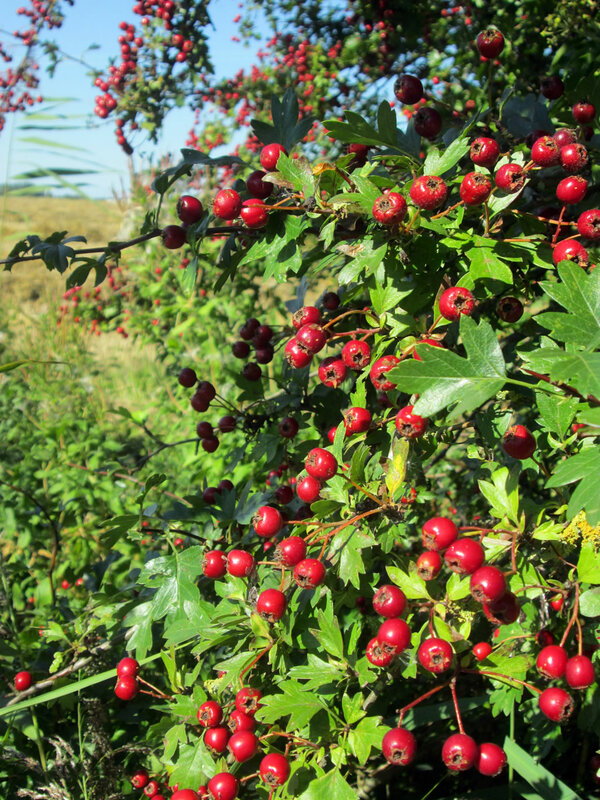 I know several places near me where there is hawthorn growing in the hedgerows. I’ll be down there in a few weeks with my scissors ;). 7. 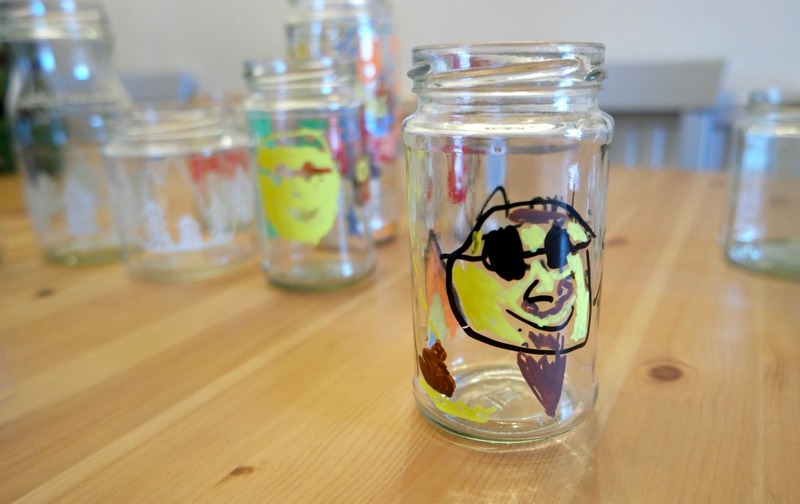 Start collecting jam jars. 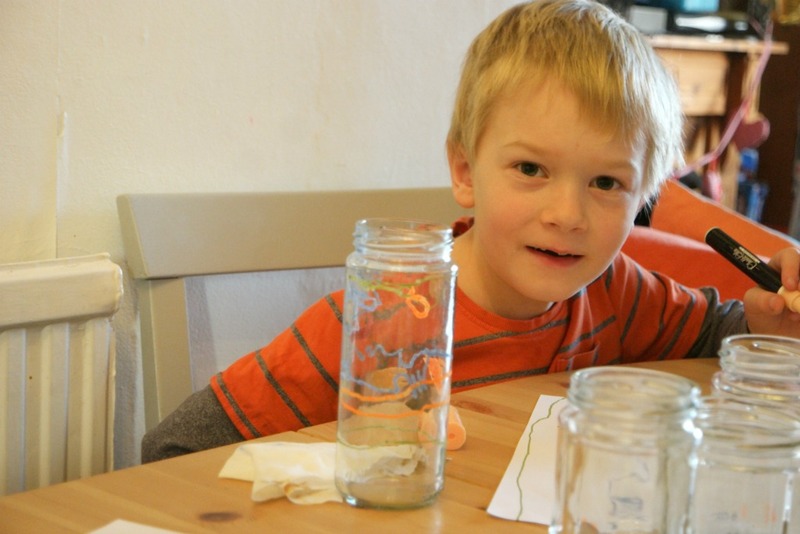 Homemade jam makes for a great last minute Christmas gift and t’s very easy to make. Just weigh the fruit, chuck it in a pan with the same weight in sugar and a little bit of water and boil it until it starts to set. 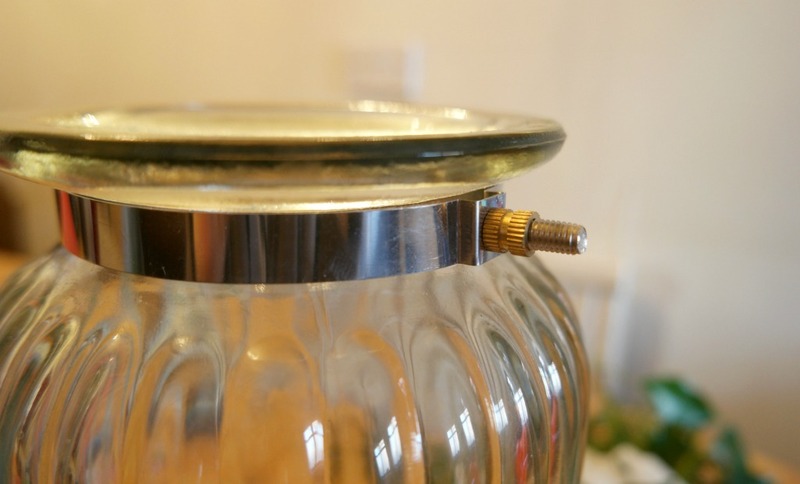 Pour the jam into sterilised jars. When it has cooled, put the lids on. Jam tastes better if it is left in the jar for a couple of weeks, so if you can make it a little while in advance, it’s worth doing so. 8. 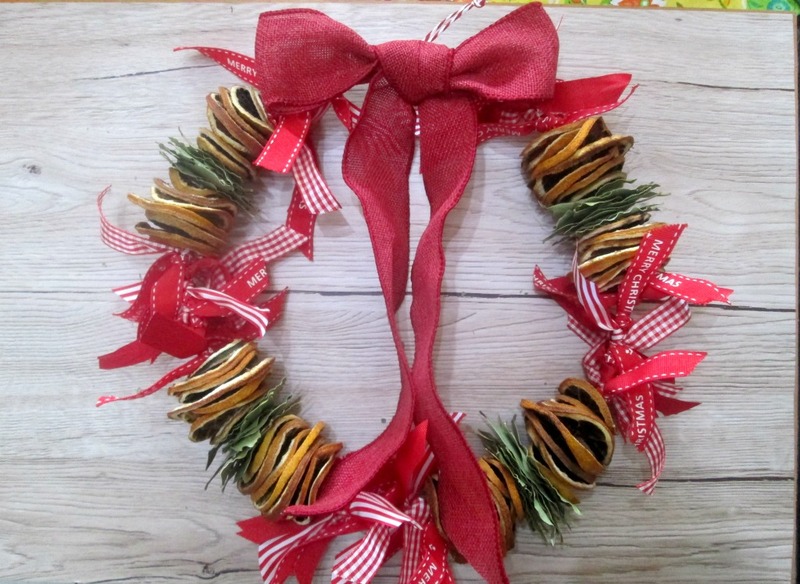 Create a Pinterest board of last minute handmade gifts. 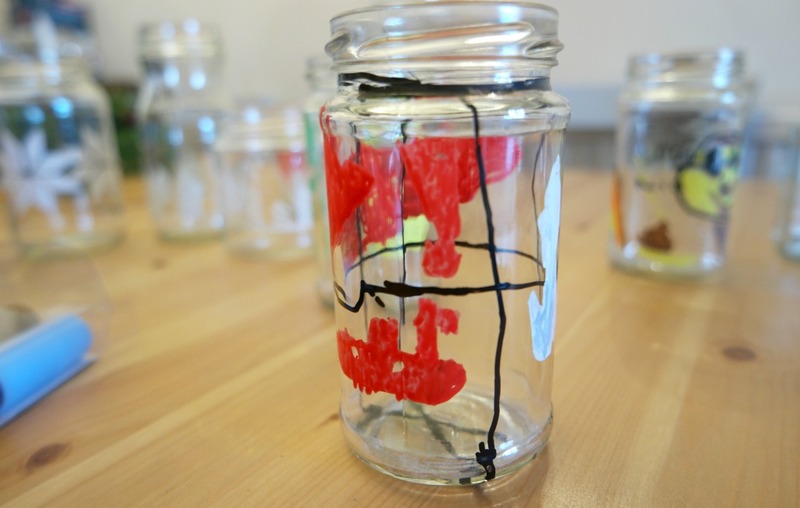 Stuff you can put in a jar is great. Sewing kits, brownie ingredients, sweets, bath stuff and natural things to make your house smell nice are all things you can make up yourself and put in a jar. 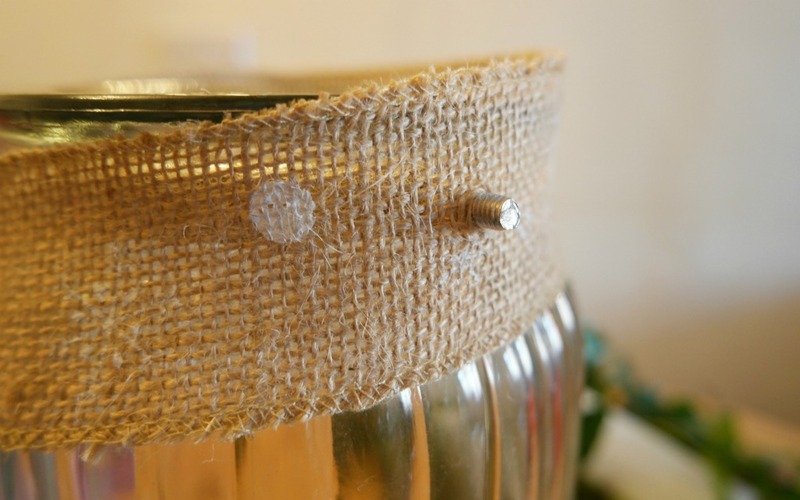 To make the jar pretty, you could tie some ribbon round it or cover the lid with a square of fabric. 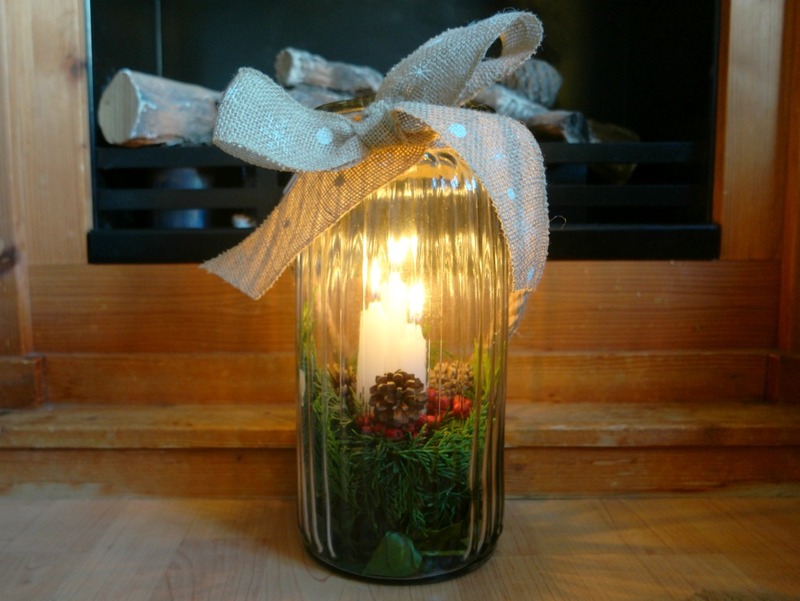 If these don’t appeal, a quick search on Pinterest will throw up plenty of other ideas for last minute Christmas gifts you can make. Although the point here is to get ourselves organised, it’s a good idea to have some ideas like this as these will probably be quick and easy things to make if you do find yourself short of time. 9. 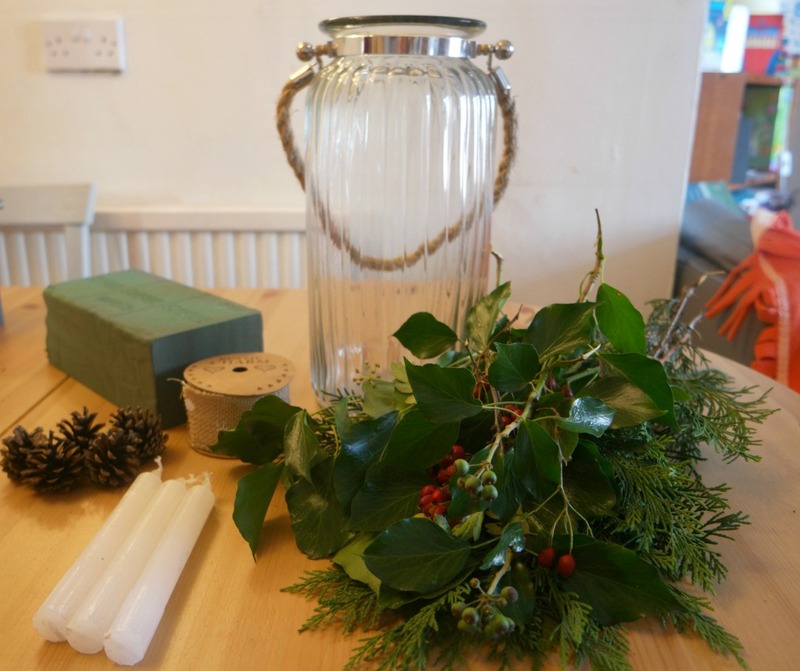 Dig out stuff you have made or started to make over the last year and decide whether you can give any of it to people as presents. A couple of years ago I had a glut of mug cosies, some of which became presents for my sons’ teachers. Perhaps you’ve made something that was more about trying out a technique than making something you needed. 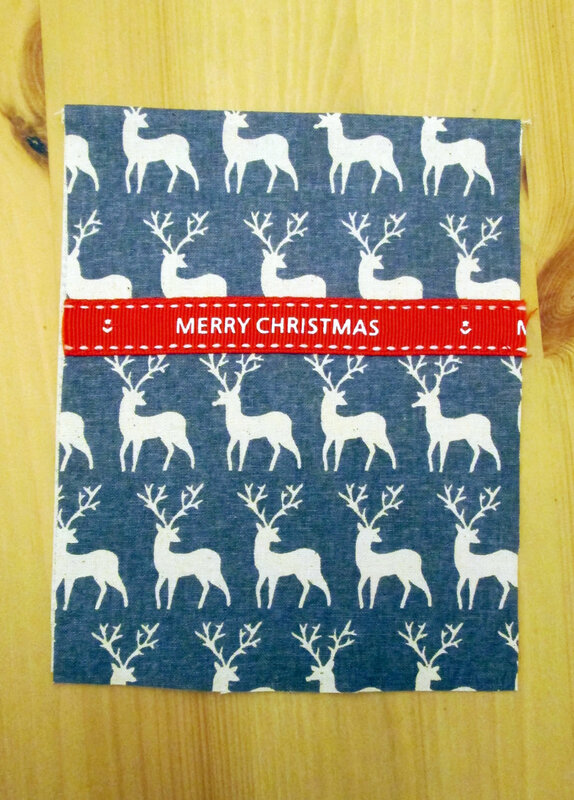 Or maybe you made lots of covered notebooks just for fun! It’s probably worth having a look at what you’ve made or not quite finished. 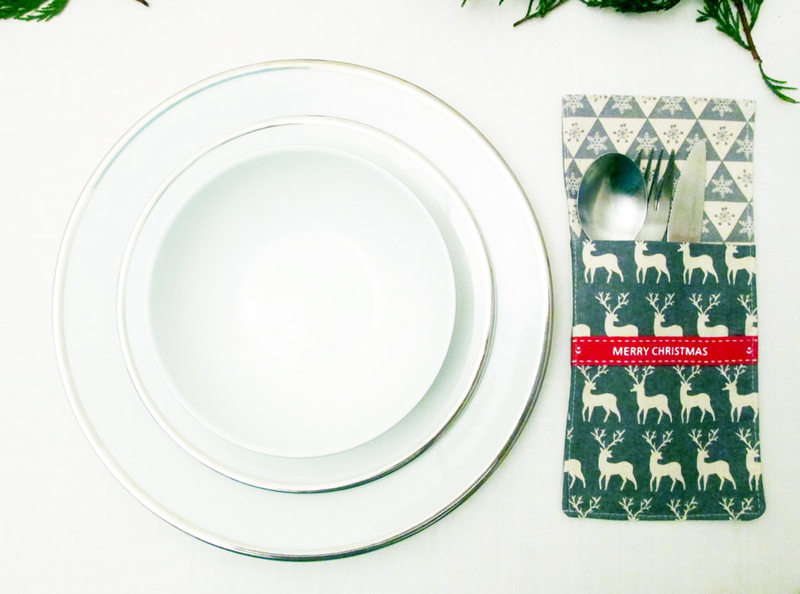 And if you want to make more gifts, it’s probably never too early to start., so that’s definitely something to start planning now. 10. Start making a list of anything else you might need. 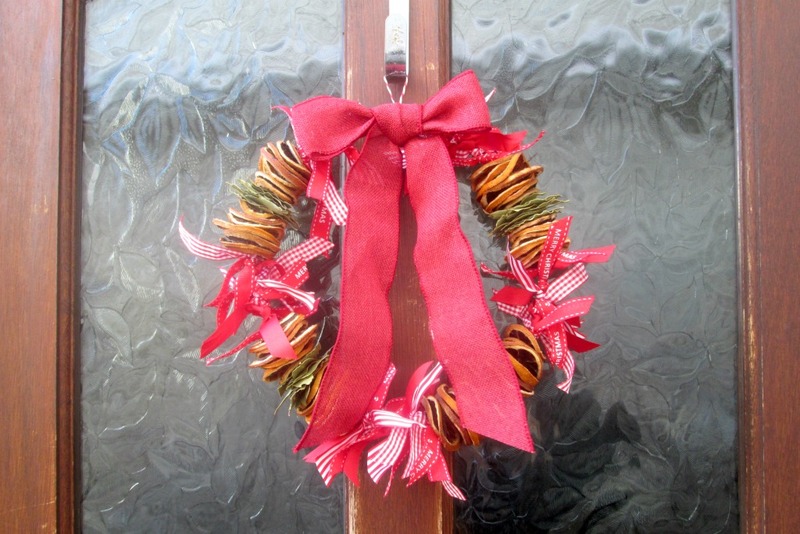 Successful Christmas crafting often needs more than fabric and ribbon alone. So start to consider what else you’ll need. 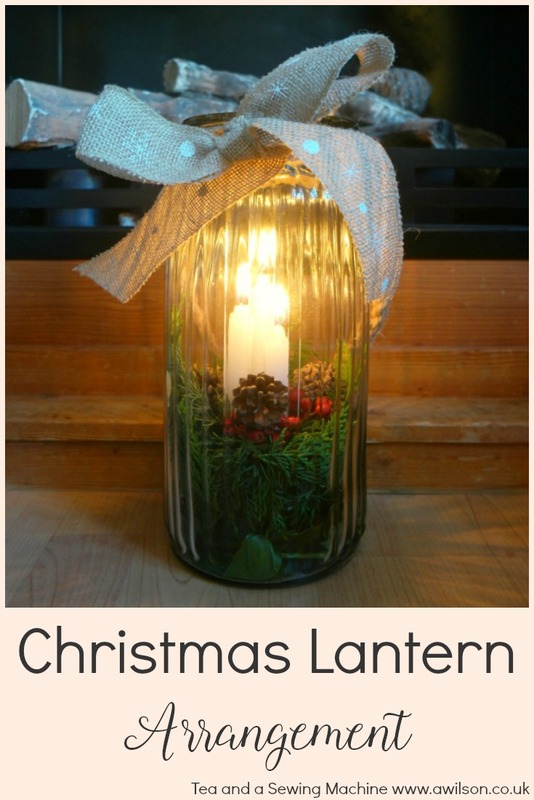 This could include oasis flower foam, wire for centrepieces, twine, raffia, buttons, glitter, gift bags and tissue paper. There’s probably a whole lot of other stuff too that you’ll think of once you start to make your list! Having a list prepared well in advance will mean that you can get stuff when you see it. 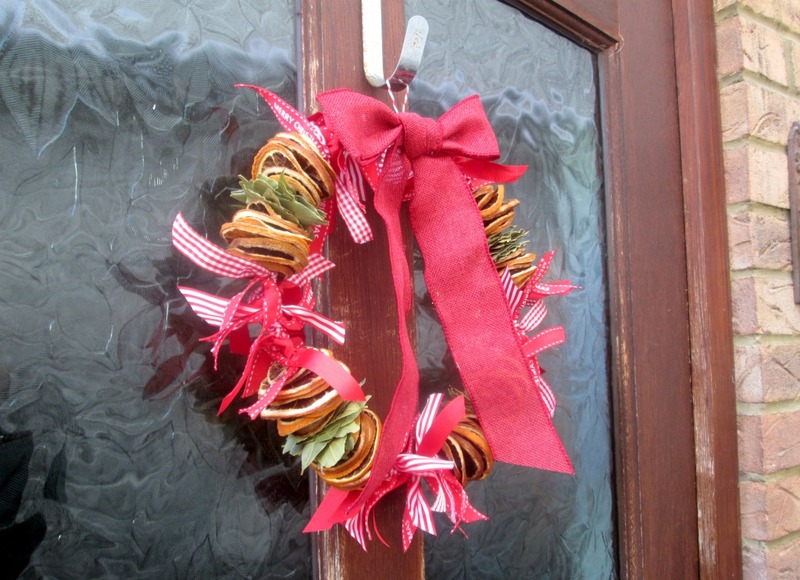 It’s no good sitting down to make a Christmas wreath then realising that you don’t have any bay leaves or florists’ wire! It also means that you won’t find yourself wandering round the Christmas section of Wilko knowing that you need stuff but not knowing exactly what! You might be interested to know that there is a Christmas craft planner available as part of the super good value Christmas bundle! You can find out more here. 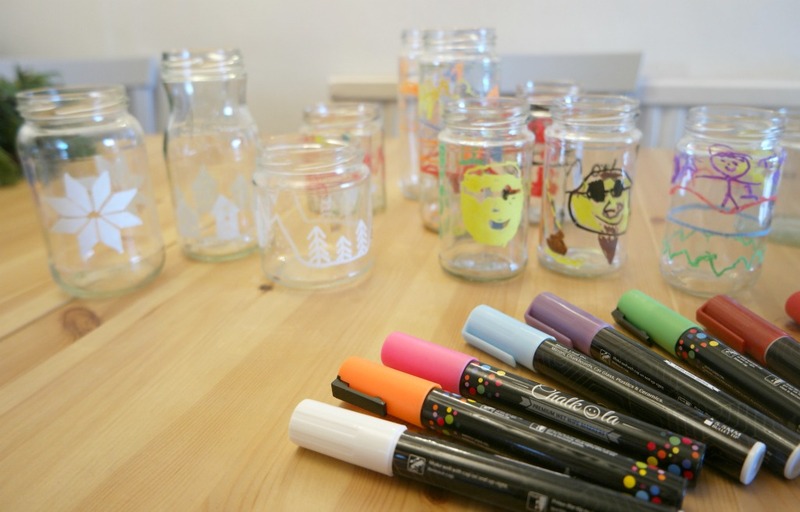 Making some diy decorated glass jars is something that I’ve wanted to try for a while. 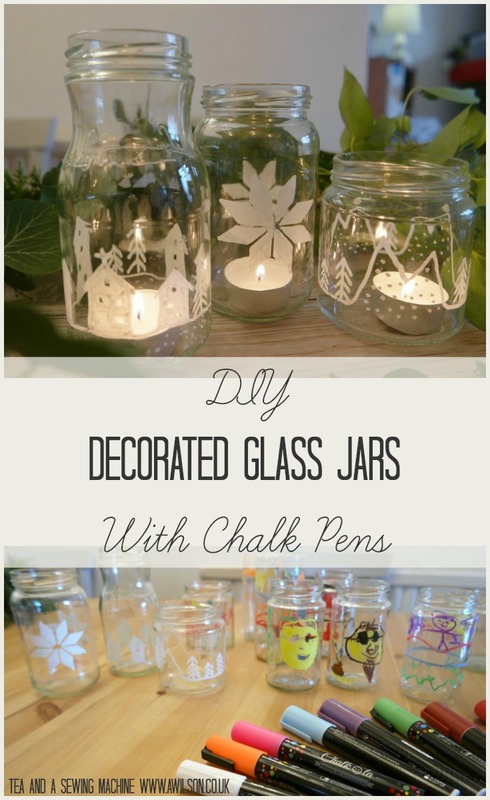 I’d previously done something similar using glass paints, but they were expensive, messy and difficult to clean up. So when I was sent some Chalkola chalk markers to try out and review, this seemed like the perfect opportunity to dry doing this in a different way! I also needed an activity that I could do with the boys to keep them out of Daddy’s way while he attended to a diy emergency. As chalk markers are totally non-toxic, this was something that they could join in with. 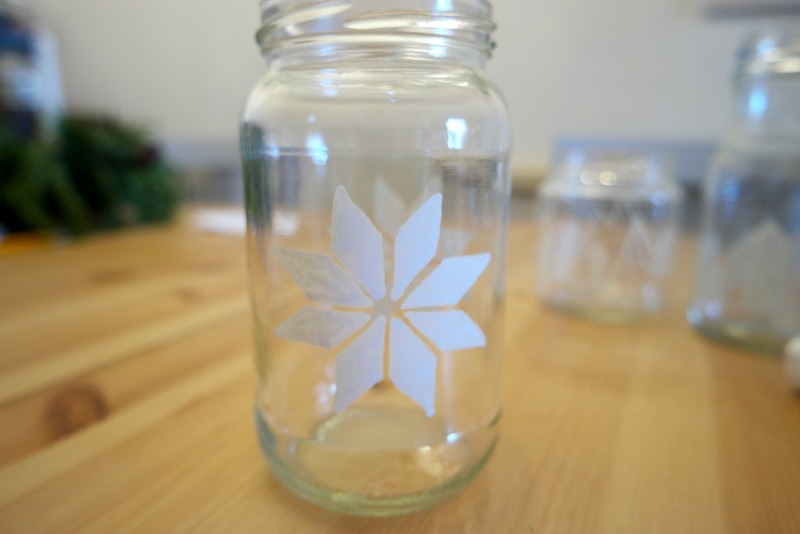 If you like the idea of making DIY decorated glass jars, keep reading because I’ve got a discount code for you that will give you 20 percent off! Before using the pens, to get the ink flowing, you have to give them a good shake, then repeatedly press the nips down. The advice I was given said that this might take a couple of minutes, but it was more like a few seconds. We did this on some bits of scrap paper. Once the ink starts flowing, it’s best to stop, otherwise you’ll end up with a puddle of chalk ink! Then all you have to do is start drawing! Any mistakes or chalk in places where you don’t want it can simply be wiped off with a baby wipe or a piece of damp kitchen towel. 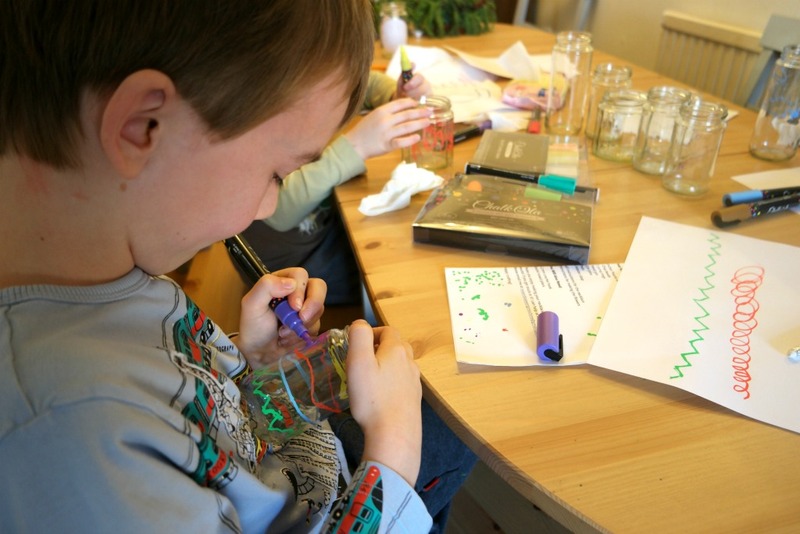 One of the things I really loved about doing this was that I could squeeze in a sneaky bit of craft time while simultaneously being a “good parent” by doing stuff with my kids ;). 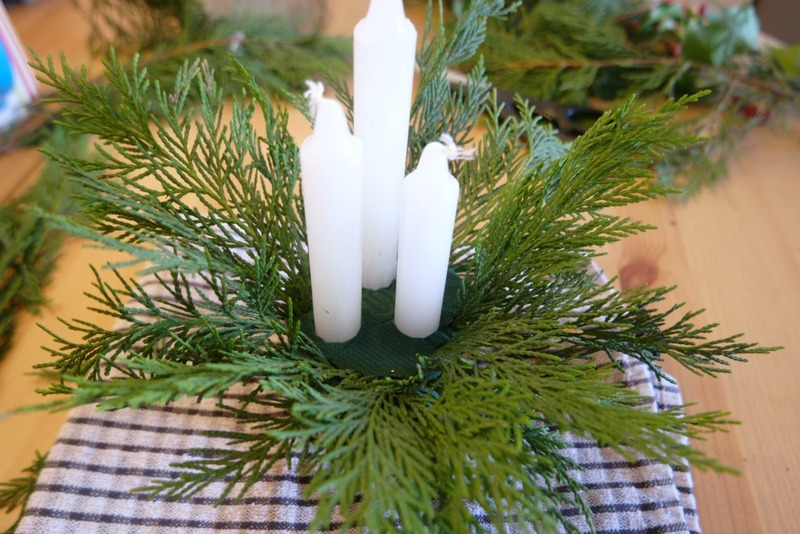 When it comes to Christmas, I love everything vaguely Scandinavian. This has only increased since we went to Norway at half term. 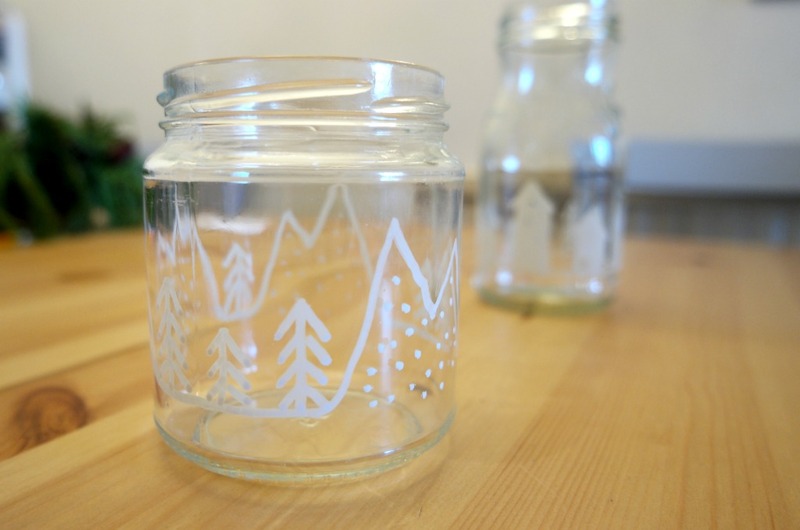 So I wanted my jars to have a Scandinavian theme. I did one with a star. I actually used the drawing I made when I was designing my felt baubles as it was already the right size. 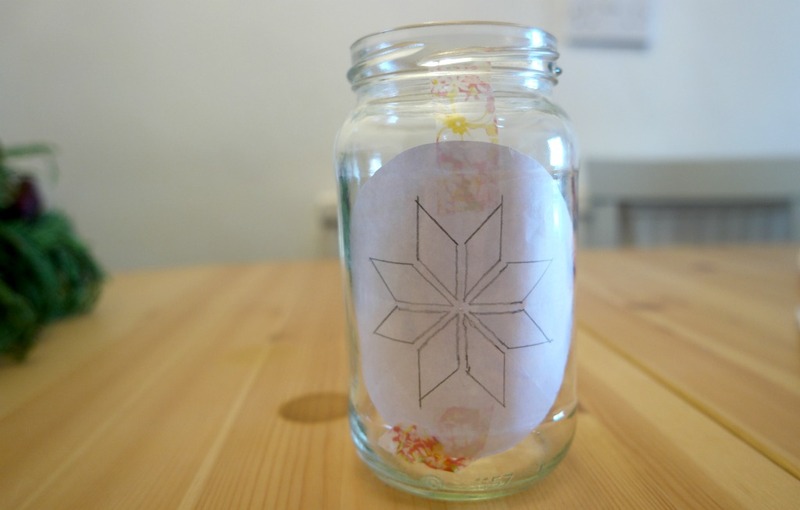 Using washi tape, I stuck it to the inside of the jar. Then all I had to do was draw over it with the chalk pen. I also did this one with mountains and trees. 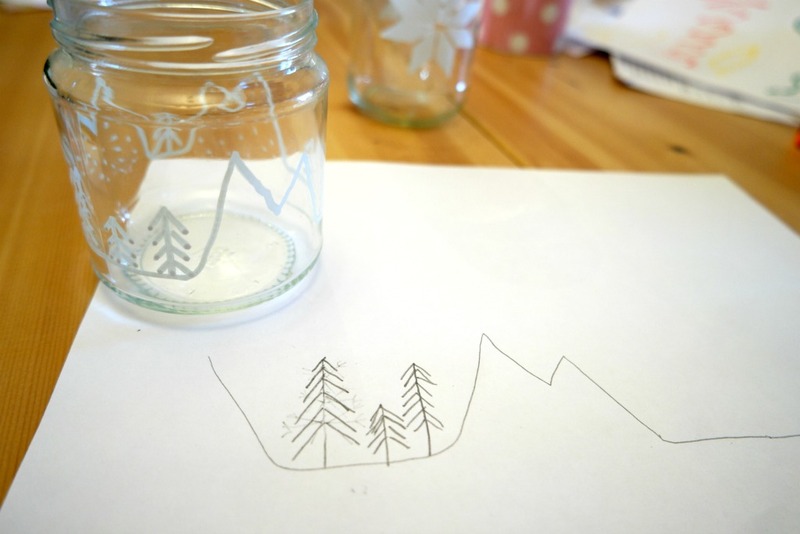 I drew the design on a piece of paper to get an idea of what I wanted to do, then I drew it straight onto the jar. And I made this one with houses, which I did in the same way. 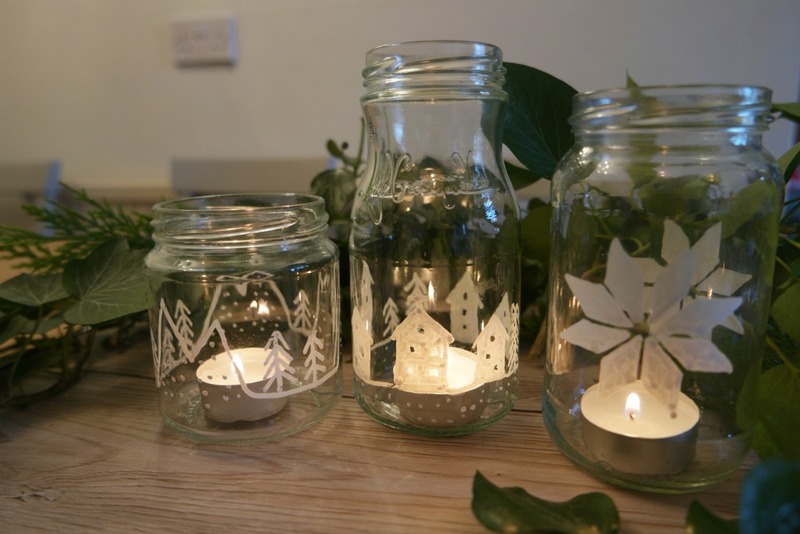 My boys were not bothered at all about doing their jars so that they would fit in with Mummy’s Nordic Christmas decor. Barnabas, who’s 7, did this one featuring the Titanic and the infamous iceberg. Aidan, who’s 9, did this one. I’ve no idea who this chap is. Cosmo (he’s 4) just had a happy time scribbling. It was very easy and a lot of fun. I actually only scored a G in my GCSE Art, but despite not being able to draw at all, I was still able to produce something that I was happy with. And my boys had a lovely time! 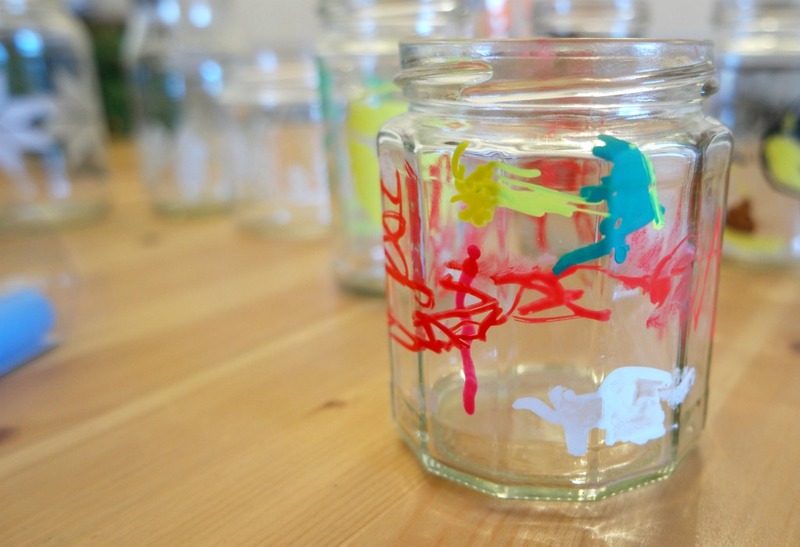 In fact, they had so much fun we ran out of jars and I had to have a rummage in the kitchen to find some more. They are versatile and can be used on a range of non porous surfaces. My younger ones had some issues with the caps. I found them fine to click back on, but they had a bit of trouble. We had caps flying about and I was worried about chalk ink going everywhere, although it didn’t. The nips are quite thick so it would be difficult to do anything very detailed. Even after the ink has dried, if you touch it with damp hands, or rub it, it will come off it. On reflection, I was very happy with the Chalkola chalk markers. 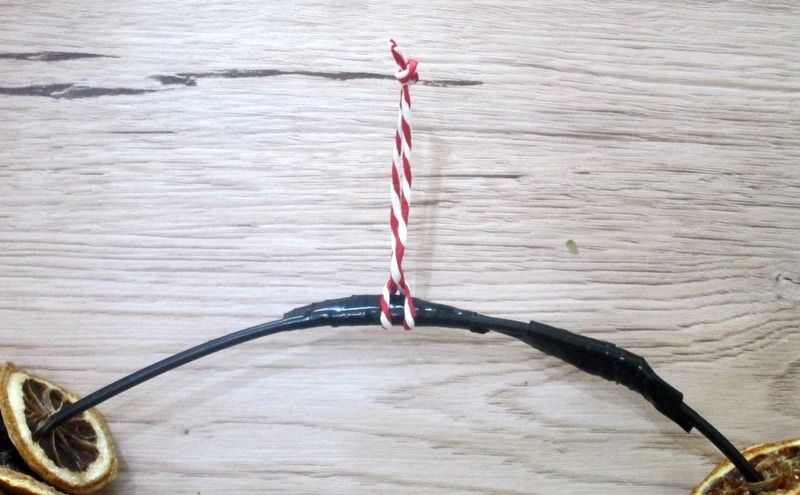 My boys and I all enjoyed using them and I’m looking forward to trying out some other ideas. 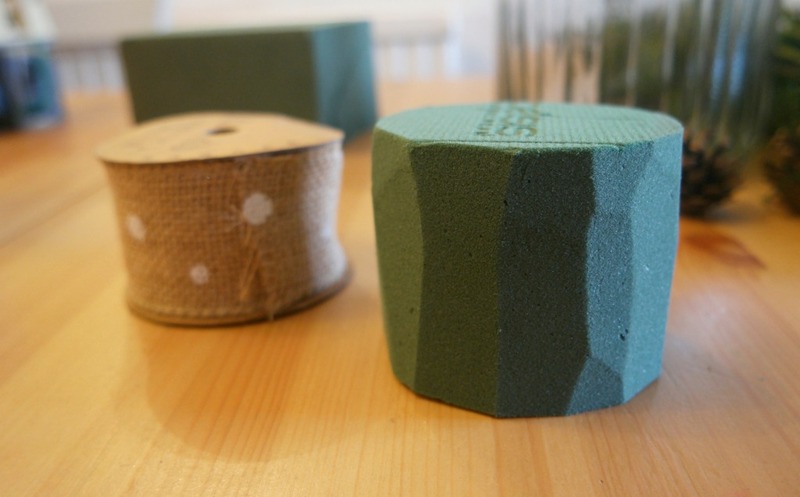 I fancy decorating some stones to make paperweights!